Product Portfolio | Mellon Medical B.V.
Its first device, the 8cm model is unique, as it is the only device able to perform automated suturing in vascular surgery. Its competitor is classical suturing, done with a (Castroviejo) needle holder and forceps, as both techniques use a suture thread to ligate the tissue. Carotid artery (endarterectomy, reconstruction, bypass), perifere bypass surgery (femoral artery plasty, peripheral bypass, aorto-iliac and iliaco-femoral bypass), deep venous reconstruction, peripheral venous reconstruction, renal and mesenteric artery reconstruction or bypass, all fistula and access surgery (native blood vessels and prothesis), essentially all vascular surgery with the exception of inlay techniques in aortic bifurcations. All anastomoses during renal, liver, pancreas, lung, and cardiac transplantation. Coronary artery bypass (CABG), thoracic aorta reconstruction and lung artery/venous anastomoses. Dural rupture during cerebral, thoracic and lumbar vertebral osteosynthesis. All Fallopian tube reconstructions and caesarian sections. All ureter, urethra and bladder wall reconstructions. All cerebral artery bypasses and dura closures. All gastric, bile duct, pancreatic, mesenteric, colonic and rectal anastomoses. These are indications, whereby surgeons whom we interviewed indicated they see real benefit (speed, less complications, reduction in cost) in using the Switch®, and as such see a natural fit for the Switch® in the execution of their work. There are, of course, many more indications in which the benefits of the Switch® technology can be applied. Besides open surgery, we believe the technology can be applied in a laparoscopic and robotic setting. So all of the procedures enumerated above, provided they can be resolved laparoscopic/robotic, …and more! 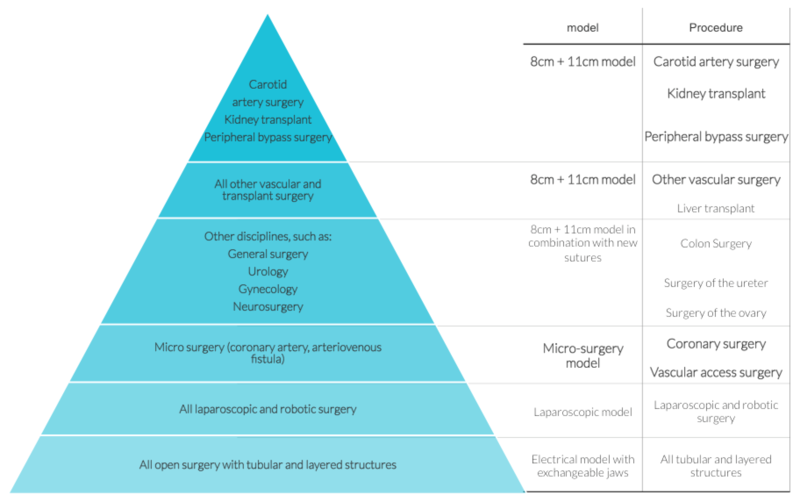 With the development of devices with varying geometries, needles and sutures and with the development of a micro surgery model, a laparoscopic and a robotic variant, Mellon can deliver the full potential of its platform. We have started the development of an 11cm version and a micro-surgery model. We expect these models to be introduced shortly after market introduction of our 8cm Switch®.